It’s not often we find ourselves in the presence of someone truly inspiring but Vibrant had the lovely task this week of being involved in an event to promote entrepreneurship with Sir Richard Branson, along with our client TEDCO Business Support. Sir Richard was in the region to host an event highlighting the success of the Virgin StartUp loans programme. 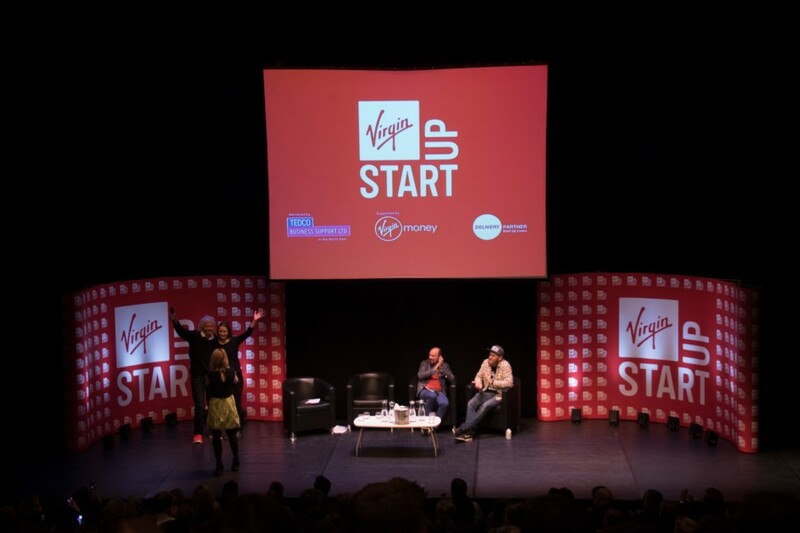 TEDCO Business Support has successfully delivered the Virgin StartUp loans programme in the North East since 2013 and jointly hosted the inspirational event for over 400 guests at a packed Northern Stage. Sir Richard Branson was joined on the panel by Sir Brian Souter and Jimmy Cregan, founder of Jimmy’s Iced Coffees, to answer questions as part of a lively Q&A session. And boy was it lively. Of course with an audience made up of over 200 students the session was always going to offer up surprises and some of the more enterprising audience members were keen to use the opportunity to pitch their business ideas, ask for a cheeky selfie and in one case read out a personally crafted poem about the man himself! Nevertheless, this was of course a business event with arguably the world’s most high profile entrepreneur leading a discussion on how to make your business idea a success. It’s fair to say we were left feeling more than a little motivated by the answers and exchanges on stage. Clearly a very astute businessman, Sir Richard was also an engaging and jovial member of the panel. His anecdotes convey a man with an innate ability to see the opportunity in the everyday and how that translates to a successful business. In the course of sharing a selection of surprising stories about how some of his more successful ventures came about it was clear that confidence and tenacity are two of the things that make a successful entrepreneur. Two things the panel clearly had in abundance. Prior to Sir Richard taking the stage, the audience was also treated to another Q&A session with a panel featuring a mixture of entrepreneurs, business mentors and Carole White and James Craft from TEDCO Business Support. Vibrant PR has worked with TEDCO Business Support for over three years and work closely with Carole and her team to communicate how TEDCO can help individuals grow, develop and set up new enterprises in the region. Certainly a fun and interesting way to spend a Tuesday and more importantly a very productive one. The event, and Sir Richard himself, garnered positive media coverage across a range of print and broadcast outlets with a selection of TEDCO supported business start-ups also getting in on the action.